You are browsing the archive for Data Package. In August 2018, Serah Rono will be running a Frictionless Data workshop in CopenHagen, congregated by the Danish National Research Data Management Forum as part of the FAIR Across project. In October 2018, she will also run a Frictionless Data workshop at FORCE11 in Montreal, Canada. Ahead of the two workshops, and other events before the close of 2018, this blog post discusses how the Frictionless Data initiative aligns with FAIR research principles. An integral part of evidence-based research is gathering and analysing data, which takes time and often requires skill and specialized tools to aid the process. Once the work is done, reproducibility requires that research reports be shared with the data and software from which insights are derived and conclusions are drawn, if at all. Widely lauded as a key measure of research credibility, reproducibility also makes a bold demand for openness by default in research, which in turn fosters collaboration. FAIR (findability, accessibility, interoperability and reusability) research principles are central to the open access and open research movements. Part of the metadata held in a data package includes licensing and author information, and has a requirement to link back to original sources thus ensuring data provenance. This serves as a great guide for users interested in your resources. Where licensing allows for resources to be archived on different platforms, this means that regardless of where users access this data from, they will be able to trace back to original sources of the data as needed. For example, all countries of the world have unique codes attached to them. See how the Country Codes data package is represented on two different platforms: GitHub, and on DataHub. With thanks to SLOAN Foundation for the new Frictionless Data For Reproducible Research grant, we will be running deep dive workshops to expound on these concepts and identify areas for improvement and collaboration in open access and open research. We have exciting opportunities in store, which we will announce in our community channels over time. We are delighted to announce that Open Knowledge has received funding from Google to work on tool integration for Data Packages as part of our broader work on Frictionless Data to support the open data community. The funding will support a growing set of tooling around Data Packages. 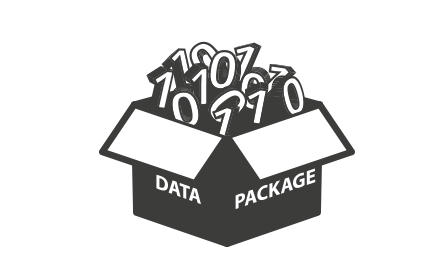 Data Packages provide functionality for data similar to “packaging” in software and “containerization” in shipping: a simple wrapper and basic structure for the transportation of data that significantly reduces the “friction” and challenges associated with data sharing and integration. Data Packages also support better automation in data processing and do so without imposing major changes on the underlying data being packaged. As an example, comprehensive country codes is a Data Package which joins together standardized country information from various sources into a single CSV file. The Data Package format, at its simplest level, allows its creator to provide information describing the fields, license, and maintainer of the dataset, all in a machine-readable format. In addition to the basic Data Package format –which supports any data structure– there are other, more specialised Data Package formats: Tabular Data Package for tabular data and based on CSV, Geo Data Package for geodata based on GeoJSON. You can also extend Data Package with your own schemas and create topic-specific Data Packages like Fiscal Data Package for public financial data. The funding supports adding Data Package integration and support to CKAN, BigQuery, and popular open-source SQL relational databases like PostgreSQL and MySQL / MariaDB. CKAN is an open source data management system that is used by many governments and civic organizations to streamline publishing, sharing, finding and using data. This project implements a CKAN extension so that all CKAN datasets are automatically available as Data Packages through the CKAN API. In addition, the extension ensures that the CKAN API natively accepts Tabular Data Package metadata and preserves this information on round-tripping. This project also creates support for import and export of Tabular Data Packages to BigQuery, Google’s web service querying massive datasets. This involves scripting and a small online service to map Tabular Data Package to BigQuery data definitions. Because Tabular Data Packages already use CSV as the data format, this work focuses on the transformation of data definitions. Finally, general SQL integration is being funded which would cover key open source databases like PostgreSQL and MySQL / MariaDB. This will allow data packages to be natively used in an even wider variety of software that depend on these databases than those listed above. These integrations move us closer to a world of “frictionless data”. For more information about our vision, visit: http://data.okfn.org/. If you have any questions, comments or would like more information, please visit this topic in our OKFN Discuss forum.